What are FAAH and Anandamide Doing In The Endocannabinoid System? HomeScienceWhat are FAAH and Anandamide? And what on earth does FAAH have to do with medical marijuana and cannabis research? This little nerve chemical your body produces can shorten your high or, in its absence, prolong it. Overproduction of FAAH can lead to depression, loss of appetite, irritability, anxiety and a host of other issues. Not coincidentally, these are the same symptoms that heavy weed users experience as marijuana withdrawal. Though not as serious or dangerous as the addiction and withdrawal from other recreational drugs like alcohol and opioids, a significant minority of pot smokers can get addicted and experience withdrawal symptoms. Read more here. FAAH stands for fatty acid amide hydrolase. It’s a specific enzyme your own nervous system makes to keep your nerve signaling running smoothly — specifically the nerve signaling that goes on in your endocannabinoid system. This is the same subdivision of your central nervous system that reacts to cannabis, producing the trademark weed high, as well as being the site of most of medical marijuana’s therapeutic benefits. FAAH breaks down your endocannabinoid neurotransmitter called anandamide (ADA), which is a crucial nerve signaling chemical that helps regulate mood, memory, perception, sleep, appetite and a host of other important physiological functions. Part of this balance requires FAAH to bind with ADA and take it apart for reuse or disposal once it has done its job. Schematic image of the breakdown of anandamide within a neuron by FAAH. 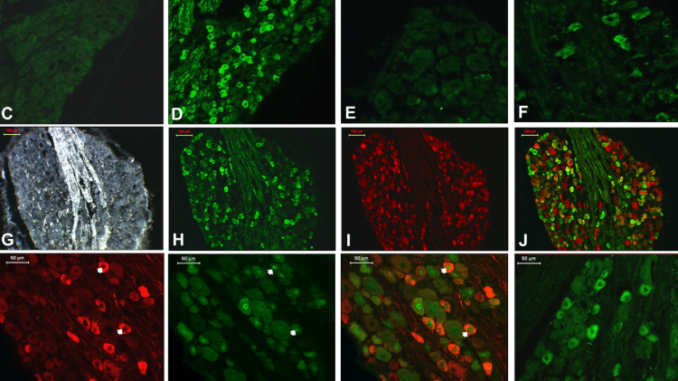 The anandamide molecule is delivered by transporter molecules to the intra-cell tissue network called the endoplasmic reticulum, the site where FAAH does its job. Image courtesy of Frontiers in Pharmacology. Anandamide is an important neurotransmitter (the chemicals used by neurons to communicate with each other) because it helps regulate the flow of other neurochemical systems to keep your body and mind functioning smoothly — one medical expert called anandamide and the rest of the endocannabinoid system “the traffic cop” of neurological function. Fun fact: Ananda is the sanskrit word for “bliss”. Anandamide was named due to its role in producing emotions and sensations commonly associated with bliss. The endocannabinoid system, like any other chemo-electric system in the your central nervous system, comprises molecules called neurotransmitters, which fit into molecular slots on the outer membranes of nerve cells called receptors. Anandamide is the most-studied neurotransmitter in the endocannabinoid system, and it interacts mainly with the neuroreceptor creatively named “Cannabinoid Receptor 1” or CB1. Because it’s chemically similar, THC displaces anandamide in the CB1 receptors. 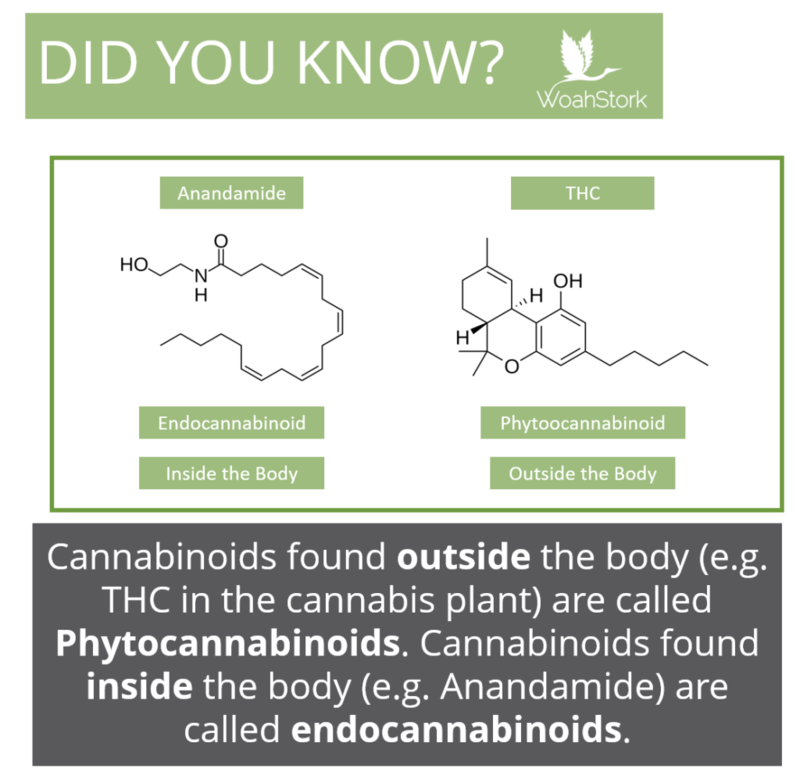 Because the structure is slightly different than anandamide and because ingesting marijuana floods the system with THC, the phytocannabinoid fits into the CB1 receptor and activates it only partially. This leads to the shift in perception and mood that most know as the marijuana high. Read a full medical description and explanation of the endocannabinoid system here. What does fatty acid amide hydrolase (FAAH) do? A nerve transmits an impulse from one cell to another by squirting neurotransmitter chemicals like anandamide across the tiny space (synapse) between one neuron and another. After its done, the body needs to stop the impulse and clean up the excess neurotransmitters for disposal or reuse. 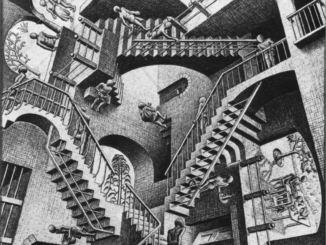 To give a simplified example: without an enzyme like FAAH to stop your impulse, you could swing a baseball bat, but you might keep spinning in circles because your body never got the message you were done swinging. The endocannabinoid system is where fatty acid amide hydrolase (FAAH) comes in. Once an anandamide molecule has unlocked a CB1 receptor and helped keep that electrochemical signal propagating down the length of the nerve, its job is done. FAAH finds where the ADA molecule is docked and then grabs it up and takes it apart. Your body will reuse some of the components or shuttle them off into the body’s waste system for you to poop or pee out eventually. Why are researchers studying FAAH? Researchers are studying FAAH as a target for pharmaceuticals because controlling levels of FAAH may produce some of the same health effects that excite clinicians about the potential for cannabis-based medicines. Cannabis-based pharmaceuticals work by flooding the system with chemicals similar to ADA and other endocannabinoids. Medicines that stop the body’s production of FAAH could have a similar effect by maximizing the amount of anandamide floating around in your nervous system. So, while cannabis medicines increase the amount of cannabinoid transmitters artificially through addition of THC, removing FAAH proportionally increases the amount of ADA naturally produced by the body. In other words, if you give the janitors the day off, the trash is gonna pile up. In the case of someone with chronic pain or an inflammatory autoimmune disorder, however, that extra ADA could be treasure rather than trash, because it could help reduce those symptoms without any of the side effects of consuming cannabis. Pharma companies have had little success in clinical trials, though, using the few different FAAH inhibitors they’ve developed in the lab — in fact, a 2016 clinical trial led to serious injuries and one death among the volunteers. Interestingly, cannabidiol (CBD), THC’s non-psychotropic twin chemical in weed, has proven to weakly inhibit production of FAAH, which can also break down THC because of its similarity to ADA. This is one of the reasons patients using synthetic prescription THC (dronabinol or Marinol), report a shorter, more intense high than people who consume whole marijuana that includes CBD. By binding with FAAH molecules, CBD knocks them out of service, allowing the THC and ADA more time to squirt around in your brain and produce their hallmark effects. Did you know? CBD helps THC produce its effects by inhibiting FAAH, which normally breaks down THC. This is a perfect example of the entourage effect. The endocannabinoid system in heavy pot users gets conditioned to produce more FAAH and less anandamide because of all the THC flooding the system. Your brain is trying to resume balance, so it ups the ante to remove what it perceives as an excess of anandamide. The theory goes that taking a drug to inhibit FAAH could provide similar therapeutic benefits to toking up. But instead of your endocannabinoid system getting flooded with THC, it’s flooded with your own naturally-occurring anandamide, as there will be proportionately more of it in your system. This means, according to researcher’s best guesses and some rodent studies, you get the medical benefits of cannabis without the artificial high. 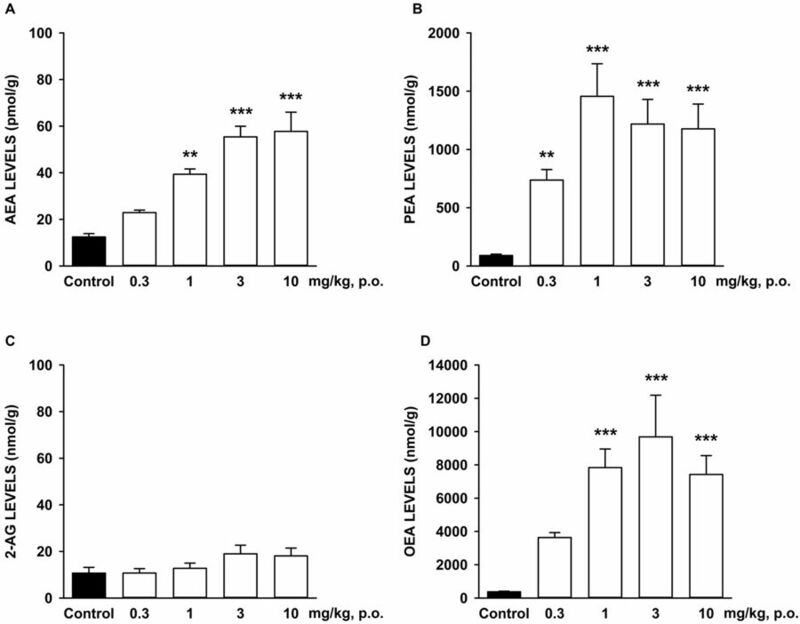 This chart shows the anandamide levels in rodents treated with an FAAH inhibitor vs. the levels in rodents in the control group. Image courtesy of Scientific Reports. A drug that inhibits FAAH is under study to ease the symptoms of marijuana withdrawal, though targeting FAAH may have a number of other medical benefits that drug researchers have yet to demonstrate. Not that they haven’t tried. Pfizer started, then canceled clinical trials of FAAH inhibitors to treat osteoarthritis pain and inflammation and cancer pain because they weren’t showing effective enough results for the pharma company to bother with the expense of continuing. Unfortunately for these patients who may have hoped for relief from FAAH inhibitor research, one FAAH inhibitor drug under study proved deadly. Six volunteers with depression developed serious neurological conditions that put five in the hospital and one in the grave during a 2016 FAAH inhibitor trial by Bial, a Portugese pharma company in partnership with France’s Biotrial. This prompted Johnson & Johnson to suspend similar research. 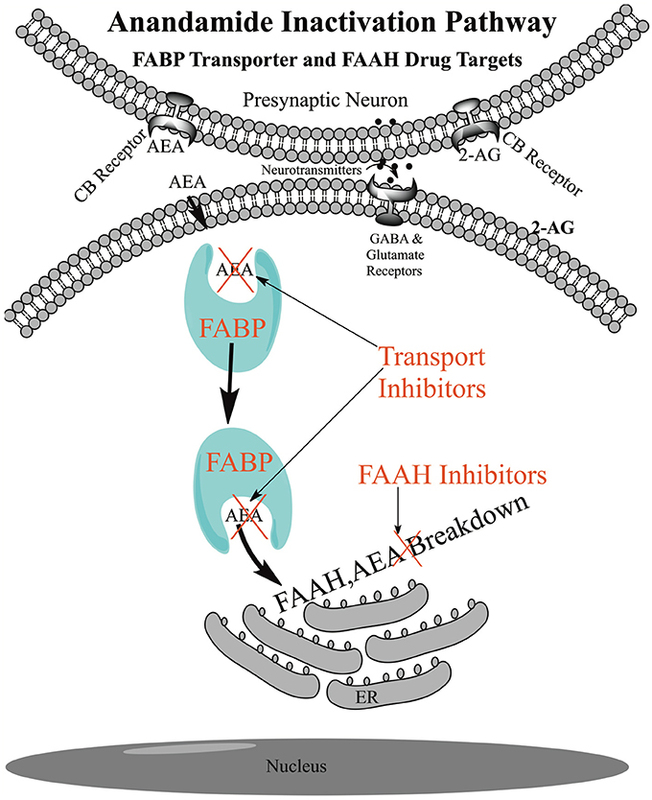 FAAH inhibitor researchers will likely proceed with caution in light of the French disaster. Curr Neuropharmacol. 2006 Jan; 4(1): 1–15. Br J Pharmacol. 2011 Aug; 163(7): 1423–1431. Cerebrum. 2013 Nov-Dec; 2013: 14.